How to get there: This mountain is located in the very east of Turkey. We travelled by air to Ankara, the capital of Turkey, then onwards by air to the city of Agri. From Agri, you can take a (mini)bus to Dogubeyazit, in about 1.5 hours. Alternatively, one can travel via Istanbul. There may be more frequent flights to the city of Van. From Van, one can also go by bus to Dogubeyazit, however, this is a somewhat longer drive. For this kind of mountain, Dogubeyazit must be designated the starting point, since travel and logistics must be organized from here. Dogubeyazit is located at N39:32.720, E044:04.964, with an elevation of about 1580 meter in the center of town. See also the more detailed and illustrated trip report. Route description: From Dogubeyazit, you need to secure transportation to the trailhead. First, proceed along the main road towards Iran, then make a left and drive through a small village Eli, and proceed gently uphill along a pretty rough road. The best vehicle is a 4WD, however ordinary mini-buses does drive this road every day. The trailhead is near a place where this road gets even a bit rougher. This location is N39:38.301, E044:14.574, with an elevation of about 2180 meter. The climbing route is roughly outlined in this picture. Base Camp and High Camp are also indicated (small print). First, one proceeds up along the rough road, the trail makes several short-cuts. 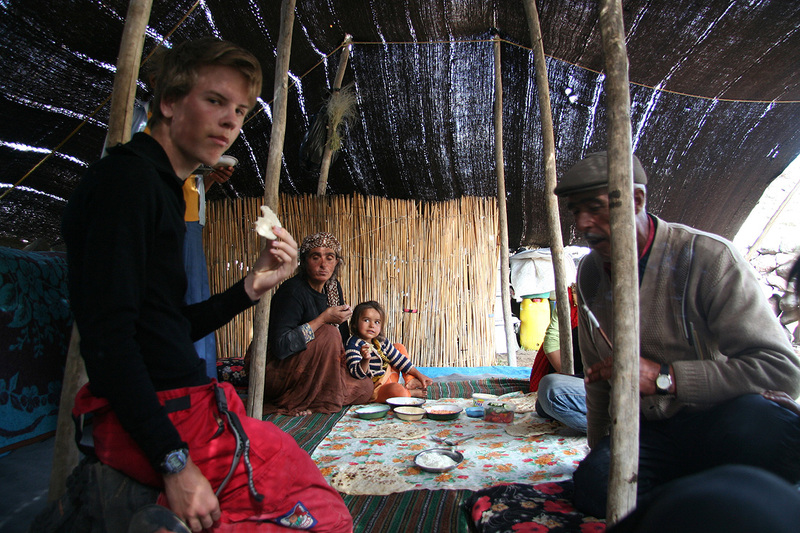 Next the trail pass through an area with quite a few Kurds looking after their sheep and cow while dwelling in traditional tents used for summer living. This location is at N39:39.154, E044:15.108, elevation about 2500 meter. A next waypoint is at N39:39.812, E044:15.370, elevation 2810 meter, before the final push up to Base Camp. The Base Camp area is actually quite distributed with 4-5 different locations, they differ quite a bit with respect to location as well as altitude. The area we used for tenting is indicated on the picture by way of "Base Camp." Our Base Camp location was very nice (best?) at location N39:40.705, E044:16.211, elevation 3340 meter. From Base Camp, the trail crosses a bit to the right (when looking uphill), then ascends two distinct hills with a somewhat flat section between them. Finally, the route proceeds up along the broad ridge to gain the area where the High Camp is located. There are many well prepared sites for tents, but the general area is full of rocks. Looking uphill, the route first climbs a bit left in order to gain what looks like a pretty distinct ridge. Thereafter, the route climbs pretty straight up the hill until the terrain becomes somewhat more gentle and permanent snow appears. When we were there, crampons could be used from location N39:41.952, E044:17.419, elevation 4830 meter. The snow part of the route continues uphill along the same line, then traverses right below an area with steeper snow. This place is called Pilatus, the characteristic V-shaped snow that extends down the broad gully near (right of when looking uphill) High Camp originates about here. This is the only place where a fall (on more icy conditions) may be dangerous. This traverse is only about 10-15 meter and completely harmless under normal conditions. The rest of the route is gentle snow with a slightly more distinct uphill near the very top. Comments: I did this climb with my son Pål Jørgen, age 18. 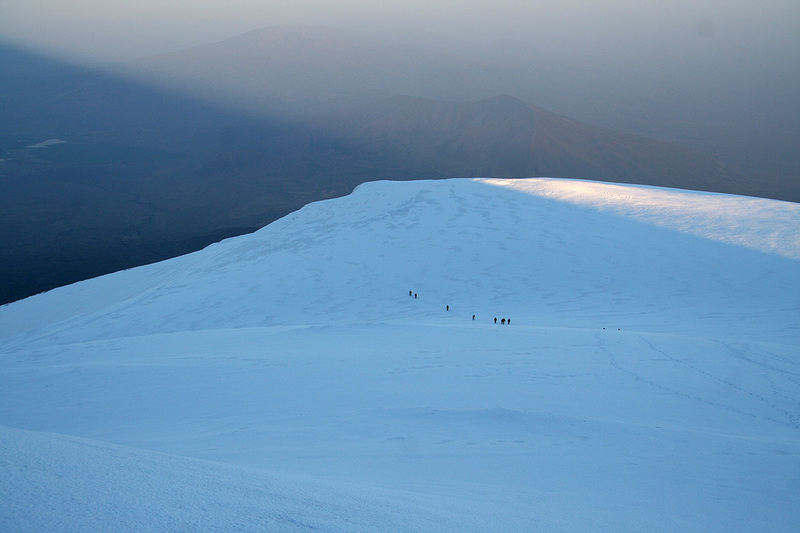 We organized this climb via a local (based in Dogubeyazit) mountain guide, Hakan Basboga. He provided excellent service and quality together with a group of very friendly and helpful team members. Thus, to organize your trip by contacting him can be recommended. 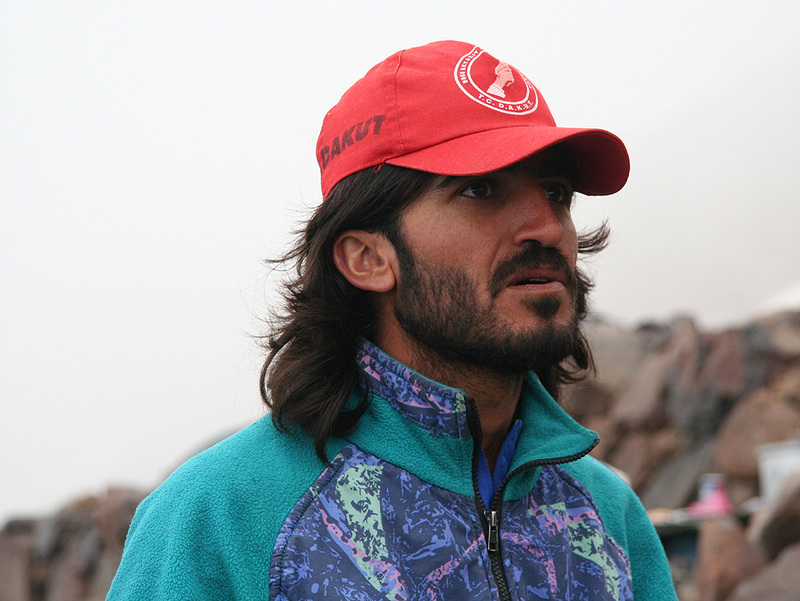 However, it seemed that the local organization of Ararat climbing support suffered somewhat from less than ideal contact and support from more central authorities in Turkey. There is a fairly complicated permit procedure and this process lacks transparancy. The guides as well as potential climbers would benefit greatly if the Turkish authorities greatly simplified both the permit system as well as the somewhat ridgid rules. Appearently, the Turkish authorities do not grant climbing priviliges to Armenians. The reason is old and complex as the mountain has been subject to many disputes between the countries. Still, I regard such behavior as utterly "childish" and totally outdated in the 21st. century. Given that Ararat now is a part of Turkish territory, they should welcome and facilitate the climb by all nationalities, Armenians included. The mountain is climbed by several thousands every year. This alone means that the permit/climbing fees that are collected should be used to help minimize human impact. A system for keeping the mountain clean from waste and garbage needs to be implemented. There is currently no organized way to handle human waste, with little effort one could establish designated facilities at the 3-4 base camp locations as well as at the more localized high camp location. Similarly, with a revision and simplification of the permit system, one should provide a transparant cost structure. The price of a climbing permit should be clearly stated. Climbers should be free to buy logistics and climbing support that meet the need of individual parties. That is, an absolute requirement that parties must have a guide on the climb should be removed. This mountain certainly ranks among the easier 5000 meter mountains in the world. Most groups travelling from far away would still chose to use a guide. The local guides will get more (not less!) business and activity from such a policy. A great many potential visitors are today prevented from even trying to visit, as they are scared away by the seemingly complex regulations. In this respect, the Turkish authorities could learn from Iran. 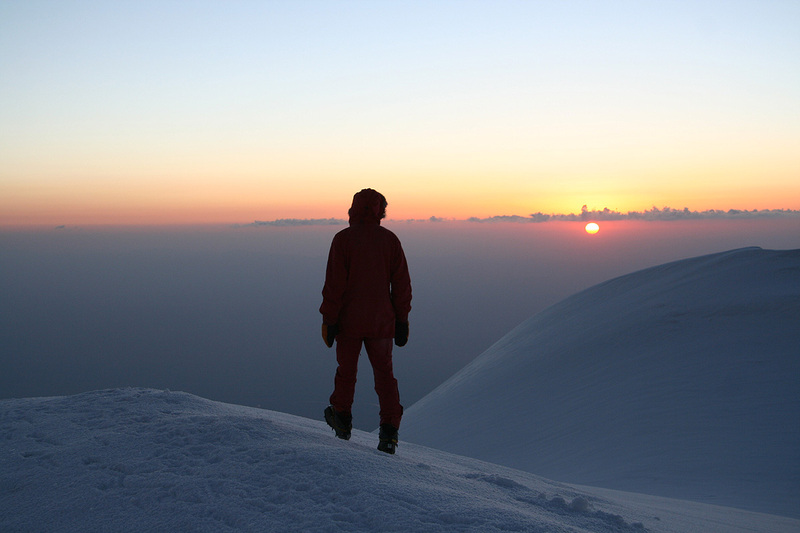 Damavand is a higher mountain, but the task of getting a climb organized is much simpler. 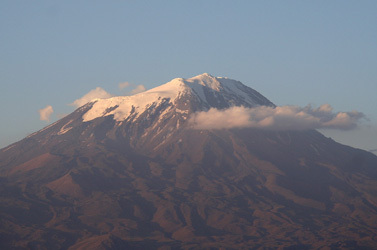 At Damavand you can buy exactly the services that you find neccessary. Also, this tends to favor the local communities as they are more flexible to provide whatever level of support is needed (transportation by mini-bus, a horse to carry supplies, the rental of tents, guiding service etc. ), while the mountain tour operators that are based elsewhere most likely would continue to offer a limited set of completely packaged trips. See further comments in the more detailed and illustrated trip report. 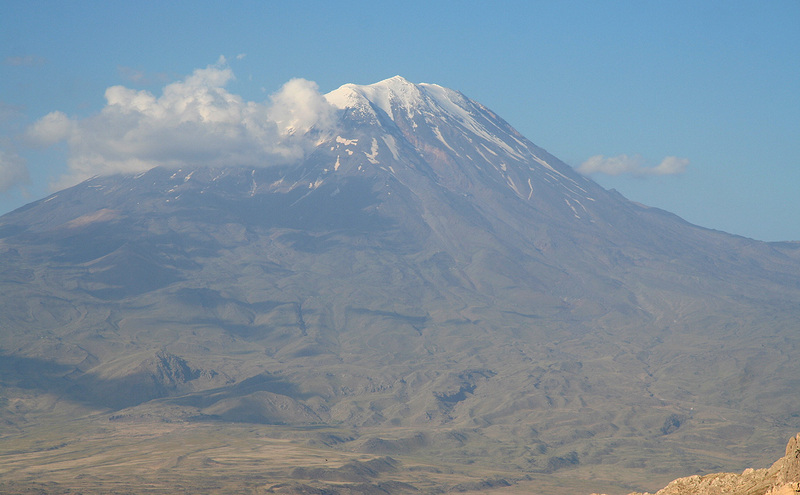 After Ararat we travelled directly into Iran in order to also climb Damavand. 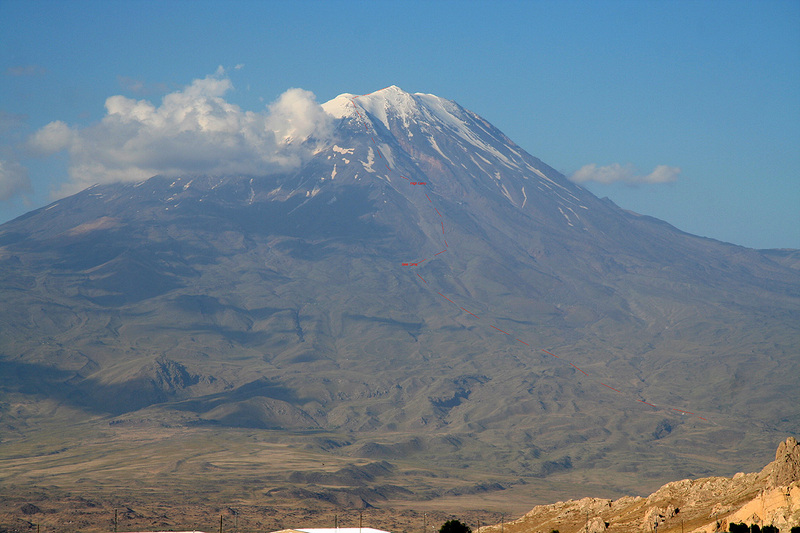 Ararat, as seen from the city of Dogubeyazit. Invited home to a Kurdish family in their summer quarter. 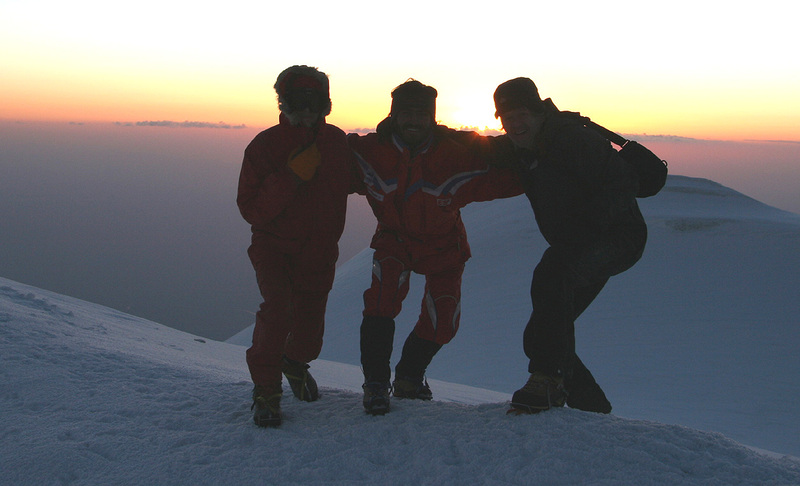 Pål Jørgen, Hakan Basboga and Petter at the Ararat summit. 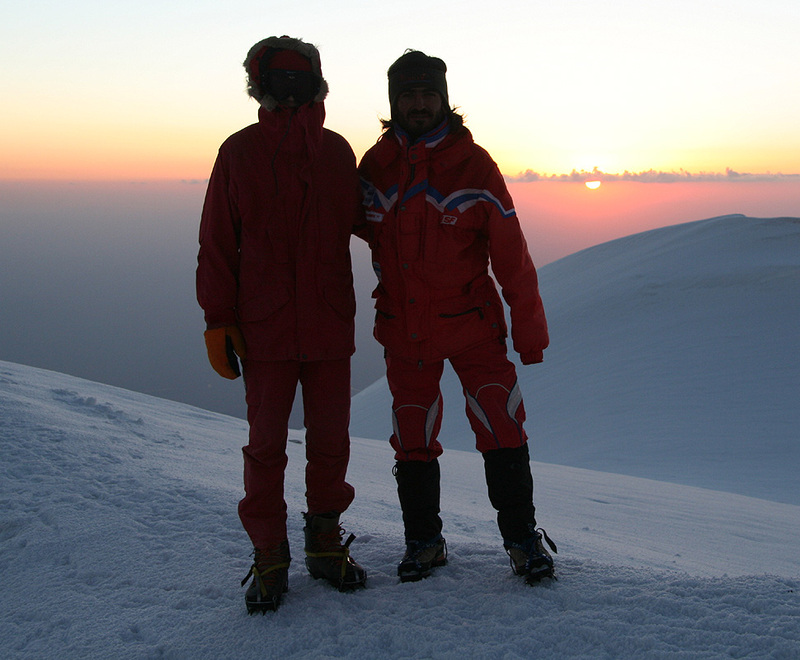 Pål Jørgen and Hakan Basboga at the Ararat summit. 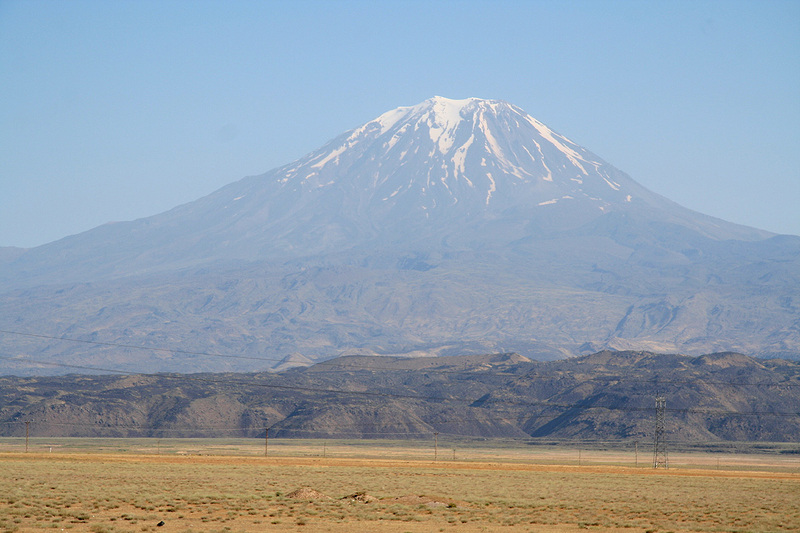 Ararat as seen from the road to the Iranian border.